Disciple: How is it, Swamiji, that you do not lecture in this country? You have stirred Europe and America with your lectures, but coming back here you have kept silence. Swamiji: In this country, the ground should be prepared first; then if the seed is sown, the plant will come out best. The ground in the West, in Europe and America is very fertile and fit for sowing seeds. There they have reached the climax of Bhoga (enjoyment). Being satiated with Bhoga to the full, their minds are not getting peace now even in those enjoyments, and they feel as if they wanted something else. In this country you have neither Bhoga nor Yoga (renunciation). When one is satiated with Bhoga, then it is that one will listen to and understand the teachings on Yoga. What good will lectures do in a country like India which has become the birthplace of disease, sorrow, and affliction, and where men are emaciated through starvation, and weak in mind? Disciple: How is that? Do you not say that ours is the land of religion and that here the people understand religion as they do nowhere else? Why then will not this country be animated by your inspiring eloquence and reap to the full the fruits thereof? Swamiji: Now understand what religion means. The first thing required is the worship of the Kurma (tortoise) Incarnation, and the belly-god is this Kurma, as it were. Until you pacify this, no one will welcome your words about religion. India is restless with the thought of how to face this spectre of hunger. The draining of the best resources of the country by the foreigners, the unrestricted exports of merchandise, and, above all, the abominable jealousy natural to slaves are eating into the vitals of India. First of all, you must remove this evil of hunger and starvation, this constant anxiety for bare existence, from those to whom you want to preach religion; otherwise, lectures and such things will be of no benefit. Disciple: What should we do then to remove that evil? Swamiji: First, some young men full of the spirit of renunciation are needed — those who will be ready to sacrifice their lives for others, instead of devoting themselves to their own happiness. With this object in view I shall establish a Math to train young Sannyâsins, who will go from door to door and make the people realise their pitiable condition by means of facts and reasoning, and instruct them in the ways and means for their welfare, and at the same time will explain to them as clearly as possible, in very simple and easy language, the higher truths of religion. The masses in our country are like the sleeping Leviathan. The education imparted by the present university system reaches one or two per cent of the masses only. And even those who get that do not succeed in their endeavours of doing any good to their country. But it is not their fault, poor fellows! As soon as they come out of their college, they find themselves fathers of several children! Somehow or other they manage to secure the position of a clerk, or at the most, a deputy magistrate. This is the finale of education! With the burden of a family on their backs, they find no time to do anything great or think anything high. They do not find means enough to fulfil their personal wants and interests; so what can be expected of them in the way of doing anything for others? Disciple: Is there then no way out for us? Swamiji: Certainly there is. This is the land of Religion Eternal. The country has fallen, no doubt, but will as surely rise again, and that upheaval will astound the world. The lower the hollows the billows make, the higher and with greater force will they rise again. Disciple: How will India rise again? Swamiji: Do you not see? The dawn has already appeared in the eastern sky, and there is little delay in the sun's rising. You all set your shoulders to the wheel! What is there in making the world all in all, and thinking of "My Samsâra (family and property), my Samsâra"? Your duty at present is to go from one part of the country to another, from village to village, and make the people understand that mere sitting idly won't do any more. Make them understand their real condition and say, "O ye brothers, arise! Awake! How much longer would you remain asleep!" Go and advise them how to improve their own condition, and make them comprehend the sublime truths of the Shâstras (scriptures), by presenting them in a lucid and popular way. So long the Brahmins have monopolised religion; but since they cannot hold their ground against the strong tide of time, go and take steps so that one and all in the land may get that religion. Impress upon their minds that they have the same right to religion as the Brahmins. Initiate all, even down to the Chandâlas (people of the lowest castes), in these fiery Mantras. Also instruct them, in simple words, about the necessities of life, and in trade, commerce, agriculture, etc. If you cannot do this then fie upon your education and culture, and fie upon your studying the Vedas and Vedanta! Disciple: But where is that strength in us? I should have felt myself blessed if I had a hundredth part of your powers, Swamiji. Swamiji: How foolish! Power and things like that will come by themselves. Put yourself to work, and you will final such tremendous power coming to you that you will feel it hard to bear. Even the least work done for others awakens the power within; even thinking the least good of others gradually instils into the heart the strength of a lion. I love you all ever so much, but I wish you all to die working for others — I should rather be glad to see you do that! Swamiji: If you are ready to sacrifice your life for others, God will certainly provide some means for them. Have you not read in the Gita (VI. 40) the words of Shri Krishna, " — Never does a doer of good, O my beloved, come to grief"? Swamiji: The essential thing is renunciation. With out renunciation none can pour out his whole heart in working for others. The man of renunciation sees all with an equal eye and devotes himself to the service of all. Does not our Vedanta also teach us to see all with an equal eye? Why then do you cherish the idea that the wife and children are your own, more than others? At your very threshold, Nârâyana Himself in the form of a poor beggar is dying of starvation! Instead of giving him anything, would you only satisfy the appetites of your wife and children with delicacies? Why, that is beastly! Disciple: To work for others requires a good deal of money at times, and where shall I get that? Swamiji: Why not do as much as lies within your power? Even if you cannot give to others for want of money, surely you can at least breathe into their ears some good words or impart some good instruction, can't you? Or does that also require money? Disciple: Yes, sir, that I can do. Swamiji: But saying, "I can", won't do. Show me through action what you can do, and then only I shall know that your coming to me is turned to some good account. Get up, and put your shoulders to the wheel — how long is this life for? As you have come into this world, leave some mark behind. Otherwise, where is the difference between you and the trees and stones? They, too, come into existence, decay and die. If you like to be born and to die like them, you are at liberty to do so. Show me by your actions that your reading the Vedanta has been fruitful of the highest good. Go and tell all, "In every one of you lies that Eternal Power", and try to wake It up. What will you do with individual salvation? That is sheer selfishness. Throw aside your meditation, throw away your salvation and such things! Put your whole heart and soul in the work to which I have consecrated myself. With bated breath the disciple heard these inspiring words, and Swamiji went on with his usual fire and eloquence. Swamiji: First of all, make the soil ready, and thousands of Vivekanandas will in time be born into this world to deliver lectures on religion. You needn't worry yourself about that! Don't you see why I am starting orphanages, famine-relief works, etc.? Don't you see how Sister Nivedita, a British lady, has learnt to serve Indians so well, by doing even menial work for them? And can't you, being Indians, similarly serve your own fellow-countrymen? Go, all of you, wherever there is an outbreak of plague or famine, or wherever the people are in distress, and mitigate their sufferings. At the most you may die in the attempt — what of that? How many like you are being born and dying like worms every day? What difference does that make to the world at large? Die you must, but have a great ideal to die for, and it is better to die with a great ideal in life. Preach this ideal from door to door, and you will yourselves be benefited by it at the same time that you are doing good to your country. On you lie the future hopes of our country. I feel extreme pain to see you leading a life of inaction. Set yourselves to work — to work! Do not tarry — the time of death is approaching day by day! Do not sit idle, thinking that everything will be done in time, later on! Mind — nothing will be done that way! Disciple: Pray, Swamiji, how can Jnâna and Bhakti be reconciled? We see the followers of the path of devotion (Bhaktas) close their ears at the name of Shankara, and again, the followers of the path of knowledge (Jnanis) call the Bhaktas fanatics, seeing them weep in torrents, or sing and dance in ecstasy, in the name of the Lord. Disciple: Yes, sir, I have. Swamiji: But there is no difference between the supreme Bhakti and the supreme Jnana. The supreme Bhakti is to realise God as the form of Prema (love) itself. If you see the loving form of God manifest everywhere and in everything, how can you hate or injure others? That realisation of love can never come so long as there is the least desire in the heart, or what Shri Ramakrishna used to say, attachment for Kâma-Kânchana (sense-pleasure and wealth). In the perfect realisation of love, even the consciousness of one's own body does not exist. Also, the supreme Jnana is to realise the oneness everywhere, to see one's own self as the Self in everything. That too cannot come so long as there is the least consciousness of the ego (Aham). Disciple: Then what you call love is the same as supreme knowledge? Swamiji: Exactly so. Realisation of love comes to none unless one becomes a perfect Jnani. Does not the Vedanta say that Brahman is Sat-Chit-Ânanda — the absolute Existence-Knowledge-Bliss? Swamiji: The phrase Sat-Chit-Ananda means — Sat, i.e. existence, Chit, i.e. consciousness or knowledge, and Ananda, i.e. bliss which is the same as love. There is no controversy between the Bhakta and the Jnani regarding the Sat aspect of Brahman. Only, the Jnanis lay greater stress on His aspect of Chit or knowledge, while the Bhaktas keep the aspect of Ananda or love more in view. But no sooner is the essence of Chit realised than the essence of Ananda is also realised. Because what is Chit is verily the same as Ananda. Disciple: Why then is so much sectarianism prevalent in India? And why is there so much controversy between the scriptures on Bhakti and Jnana? — "The name of the Lord Hari, the name of the Lord Hari, the name of the Lord Hari alone. Verily, there is no other, no other, no other path than this in the age of Kali." Someone, again, let us suppose, might have attained perfection with the name of Allah, and immediately another creed originated by him began to spread, and so on. But we have to see what is the end to which all these forms of worship and other religious practices are intended to lead. The end is Shraddhâ. We have not any synonym in our Bengali language to express the Sanskrit word Shraddha. The (Katha) Upanishad says that Shraddha entered into the heart of Nachiketâ. Even with the word Ekâgratâ (one-pointedness) we cannot express the whole significance of the word Shraddha. The word Ekâgranishthâ (one-pointed devotion) conveys, to a certain extent, the meaning of the word Shraddha. If you meditate on any truth with steadfast devotion and concentration, you will see that the mind is more and more tending onwards to Oneness, i.e. taking you towards the realisation of the absolute Existence-Knowledge-Bliss. The scriptures on Bhakti or Jnana give special advice to men to take up in life the one or the other of such Nishthas (scrupulous persistence) and make it their own. With the lapse of ages, these great truths become distorted and gradually transform themselves into Deshâchâras or the prevailing customs of a country. It has happened, not only in India, but in every nation and every society in the world. And the common people, lacking in discrimination, make these the bone of contention and fight among themselves. They have lost sight of the end, and hence sectarianism, quarrels, and fights continue. Disciple: What then is the saving means, Swamiji? Swamiji: That true Shraddha, as of old, has to be brought back again. The weeds have to be taken up by the roots. In every faith and in every path, there are, no doubt, truths which transcend time and space, but a good deal of rubbish has accumulated over them. This has to be cleared away, and the true eternal principles have to be held before the people; and then only, our religion and our country will be really benefited. Disciple: How will that be effected? Swamiji: Why, first of all, we have to introduce the worship of the great saints. Those great-souled ones who have realised the eternal truths are to be presented before the people as the ideas to be followed; as in the case of India — Shri Râmachandra, Shri Krishna, Mahâvira and Shri Ramakrishna, among others. Can you bring in the worship of Shri Ramachandra and Mahavira in this country? Keep aside for the present the Vrindâvan aspect of Shri Krishna, and spread far and wide the worship of Shri Krishna roaring the Gita out, with the voice of a Lion. And bring into daily use the worship of Shakti — the divine Mother, the source of all power. Disciple: Is the divine play of Shri Krishna with the Gopis of Vrindavan not good, then? Swamiji: Under the present circumstances, that worship is of no good to you. Playing on the flute and so on will not regenerate the country. We now mostly need the ideal of a hero with the tremendous spirit of Rajas thrilling through his veins from head to foot — the hero who will dare and die to know the Truth — the hero whose armour is renunciation, whose sword is wisdom. We want now the spirit of the brave warrior in the battlefield of life, and not of the wooing lover who looks upon life as a pleasure-garden! Disciple: Is then the path of love, as depicted in the ideal of the Gopis, false? Swamiji: Who says so? Not I! That is a very superior form of worship (Sâdhanâ). In this age of tremendous attachment to sense-pleasure and wealth, very few are able even to comprehend those higher ideals. Disciple: Then are not those who are worshipping God as husband or lover (Madhura) following the proper path? Swamiji: I dare say not. There may be a few honourable exceptions among them, but know, that the greater part of them are possessed of dark Tâmasika nature. Most of them are full of morbidity and affected with exceptional weakness. The country must be raised. The worship of Mahavira must be introduced; the Shakti-pujâ must form a part of our daily practice; Shri Ramachandra must be worshipped in every home. Therein lies your welfare, therein lies the good of the country — there is no other way. Disciple: But I have heard that Bhagavan Shri Ramakrishna used to sing the name of God very much? Swamiji: Quite so, but his was a different case. What comparison can there be between him and ordinary men? He practiced in his life all the different ideals of religion to show that each of them leads but to the One Truth. Shall you or I ever be able to do all that he has done? None of us has understood him fully. So, I do not venture to speak about him anywhere and everywhere. He only knows what he himself really was; his frame was a human one only, but everything else about him was entirely different from others. Disciple: Do you, may I ask, believe him to be an Avatara (Incarnation of God)? Swamiji: Tell me first — what do you mean by an Avatara? Disciple: Why, I mean one like Shri Ramachandra, Shri Krishna, Shri Gauranga, Buddha, Jesus, and others. Swamiji: I know Bhagavan Shri Ramakrishna to be even greater than those you have just named. What to speak of believing, which is a petty thing — I know! Let us, however, drop the subject now; more of it another time. After a pause Swamiji continued: To re-establish the Dharma, there come Mahâpurushas (great teachers of humanity), suited to the needs of the times and society. Call them what you will — either Mahapurushas or Avataras — it matters little. They reveal, each in his life, the ideal. Then, by degrees, shapes are moulded in their matrices — MEN are made! Gradually, sects arise and spread. As time goes on, these sects degenerate, and similar reformers come again. This has been the law flowing in uninterrupted succession, like a current, down the ages. Disciple: Why do you not preach Shri Ramakrishna as an Avatara? You have, indeed, power, eloquence, and everything else needed to do it. Swamiji: Truly, I tell you, I have understood him very little. He appears to me to have been so great that, whenever I have to speak anything of him, I am afraid lest I ignore or explain away the truth, lest my little power does not suffice, lest in trying to extol him I present his picture by painting him according to my lights and belittle him thereby! Disciple: But many are now preaching him as an Avatara. Swamiji: Let them do so if they like. They are doing it in the light in which they have understood him. You too can go and do the same, if you have understood him. Disciple: I cannot even grasp you, what to say of Shri Ramakrishna! I should consider myself blessed in this life if I get a little of Your grace. Disciple: Pray, Swamiji, if the one Brahman is the only Reality, why then exists all this differentiation in the world? Swamiji: Are you not considering this question from the point of view of phenomenal existence? Looking from the phenomenal side of existence, one can, through reasoning and discrimination, gradually arrive at the very root of Unity. But if you were firmly established in that Unity, how from that standpoint, tell me, could you see this differentiation? Disciple: True, if I had existed in the Unity, how should I be able to raise this question of "why"? As I put this question, it is already taken for granted that I do so by seeing this diversity. Swamiji: Very well. To enquire about the root of Oneness through the diversity of phenomenal existence is named by the Shâstras as Vyatireki reasoning, or the process of arguing by the indirect method, that is, Adhyâropa and Apavâda, first taking for granted something that is nonexistent or unreal as existing or real, and then showing through the course of reasoning that that is not a substance existing or real. You are talking of the process of arriving at the truth through assuming that which is not-true as true — are you not? Disciple: To my mind, the state of the existing or the seen seems to be self-evident, and hence true, and that which is opposite to it seems, on the other hand, to be unreal. Swamiji: But the Vedas say, "One only without a second". And if in reality there is the One only that exists — the Brahman — then, your differentiation is false. You believe in the Vedas, I suppose? Disciple: Oh, yes, for me self I hold the Vedas as the highest authority; but if, in argument, one does not accept them to be so, one must, in that case, have to be refuted by other means. Swamiji: That also can be done. Look here, a time comes when what you call differentiation vanishes, and we cannot perceive it at all. I have experienced that state in my own life. Disciple: When have you done so? Swamiji: One day in the temple-garden at Dakshineswar Shri Ramakrishna touched me over the heart, and first of all I began to see that the houses — rooms, doors, windows, verandahs — the trees, the sun, the moon — all were flying off, shattering to pieces as it were — reduced to atoms and molecules — and ultimately became merged in the Âkâsha. Gradually again, the Akasha also vanished, and after that, my consciousness of the ego with it; what happened next I do not recollect. I was at first frightened. Coming back from that state, again I began to see the houses, doors, windows, verandahs, and other things. On another occasion, I had exactly the same realisation by the side of a lake in America. Disciple: Might not this state as well be brought about by a derangement of the brain? And I do not understand what happiness there can be in realising such a state. Swamiji: A derangement of the brain! How can you call it so, when it comes neither as the result of delirium from any disease, nor of intoxication from drinking, nor as an illusion produced by various sorts of queer breathing exercises — but when it comes to a normal man in full possession of his health and wits? Then again, this experience is in perfect harmony with the Vedas. It also coincides with the words of realisation of the inspired Rishis and Âchâryas of old. Do you take me, at last, to be a crack-brained man? (smiling). Disciple: Oh, no, I did not mean that of course. When there are to be found hundreds of illustrations about such realisation of Oneness in the Shastras, and when you say that it can be as directly realised as a fruit in the palm of one's hand, and when it has been your own personal experience in life, perfectly coinciding with the words of the Vedas and other Shastras — how dare I say that it is false? Shri Shankaracharya also realising that state has said, "Where is the universe vanished? " and so on. Swamiji: Know — this knowledge of Oneness is what the Shastras speak of as realisation of the Brahman, by knowing which, one gets rid of fear, and the shackles of birth and death break for ever. Having once realised that Supreme Bliss, one is no more overwhelmed by pleasure and pain of this world. Men being fettered by base lust-and-wealth cannot enjoy that Bliss of Brahman. Disciple: If it is so, and if we are really of the essence of the Supreme Brahman, then why do we not exert ourselves to gain that Bliss? Why do we again and again run into the jaws of death, being decoyed by this worthless snare of lust-and-wealth? Swamiji: You speak as if man does not desire to have that Bliss! Ponder over it, and you will see that whatever anyone is doing, he is doing in the hope of gaining that Supreme Bliss. Only, not everyone is conscious of it and so cannot understand it. That Supreme Bliss fully exists in all, from Brahmâ down to the blade of grass. You are also that undivided Brahman. This very moment you can realise if you think yourself truly and absolutely to be so. It is all mere want of direct perception. That you have taken service and work so hard for the sake of your wife also shows that the aim is ultimately to attain to that Supreme Bliss of Brahman. Being again and again entangled in the intricate maze of delusion and hard hit by sorrows and afflictions, the eye will turn of itself to one's own real nature, the Inner Self. It is owing to the presence of this desire for bliss in the heart, that man, getting hard shocks one after another, turns his eye inwards — to his own Self. A time is sure to come to everyone, without exception, when he will do so to one it may be in this life, to another, after thousands of incarnations. Disciple: It all depends upon the blessings of the Guru and the grace of the Lord! Swamiji: The wind of grace of the Lord is blowing on, for ever and ever. Do you spread your sail. Whenever you do anything, do it with your whole heart concentrated on it. Think day and night, "I am of the essence of that Supreme Existence-Knowledge-Bliss — what fear and anxiety have I? This body, mind, and intellect are all transient, and That which is beyond these is myself." Disciple: Thoughts like these come only for a while now and then, but quickly vanish, and I think all sorts of trash and nonsense. Swamiji: It happens like that in the initial stage, but gradually it is overcome. But from the beginning, intensity of desire in the mind is needed. Think always, "I am ever-pure, ever-knowing, and ever-free; how can I do anything evil? Can I ever be befooled like ordinary men with the insignificant charms of lust and wealth?" Strengthen the mind with such thoughts. This will surely bring real good. Swamiji: Whenever such thoughts come in the mind, discriminate within yourself between the real and the unreal. Have you not read the Vedanta? Even when you sleep, keep the sword of discrimination at the head of your bed, so that covetousness cannot approach you even in dream. Practising such strength, renunciation will gradually come, and then you will see — the portals of heaven are wide open to you. Disciple: If it is so, Swamiji, how is it then that the texts on Bhakti say that too much of renunciation kills the feelings that make for tenderness? Swamiji: Throw away, I say, texts which teach things like that! Without renunciation, without burning dispassion for sense-objects, without turning away from wealth and lust as from filthy abomination — " — never can one attain salvation even in hundreds of Brahma's cycles". Repeating the names of the Lord, meditation, worship, offering libations in sacred fire, penance — all these are for bringing forth renunciation. One who has not gained renunciation, know his efforts to be like unto those of the man who is pulling at the oars all the while that the boat is at anchor. " — Neither by progeny nor by wealth, but by renunciation alone some (rare ones) attained immortality" (Kaivalya Upanishad, 3). Disciple: Will mere renouncing of wealth and lust accomplish everything? Swamiji: There are other hindrances on the path even after renouncing those two; then, for example, comes name and fame. Very few men, unless of exceptional strength, can keep their balance under that. People shower honours upon them, and various enjoyments creep in by degrees. It is owing to this that three-fourths of the Tyâgis are debarred from further progress! For establishing this Math and other things, who knows but that I may have to come back again! Disciple: If you say things like that, then we are undone! Swamiji: What fear? " — Be fearless, be fearless, be fearless!" You have seen Nâg Mahâshaya how even while living the life of a householder, he is more than a Sannyâsin! This is very uncommon; I have rarely seen one like him. If anyone wants to be a householder, let him be like Nag Mahashaya. He shines like a brilliant luminary in the spiritual firmament of East Bengal. Ask the people of that part of the country to visit him often; that will do much good to them. Disciple: Nag Mahashaya, it seems, is the living personification of humility in the play of Shri Ramakrishna's divine drama on earth. Swamiji: Decidedly so, without a shadow of doubt! I have a wish to go and see him once. Will you go with, me? I love to see fields flooded over with water in the rains. Will you write to him? Disciple: Certainly I will. He is always mad with joy when he hears about you, and says that East Bengal will be sanctified into a place of pilgrimage by the dust of your feet. Swamiji: Do you know, Shri Ramakrishna used to speak of Nag Mahashaya as a "flaming fire"? Disciple: Yes, so I have heard. At the request of Swamiji, the disciple partook of some Prasâda (consecrated food), and left for Calcutta late in the evening; he was deeply thinking over the message of fearlessness that he had heard from the lips of the inspired teacher — "I am free!" "I am free!" Disciple: Shri Ramakrishna used to say, Swamiji, that a man cannot progress far towards religious realisation unless he first relinquishes Kâma-Kânchana (lust and greed). If so, what will become of householders? For their whole minds are set on these two things. Swamiji: It is true that the mind can never turn to God until the desire for lust and wealth has gone from it, be the man a householder or a Sannyâsin. Know this for a fact, that as long as the mind is caught in these, so long true devotion, firmness, and Shraddhâ (faith) can never come. Disciple: Where will the householders be, then? What way are they to follow? Swamiji: To satisfy our smaller desires and have done with them for ever, and to relinquish the greater ones by discrimination — that is the way. Without renunciation God can never be realised — — even if Brahma himself enjoined otherwise! Disciple: But does renunciation of everything come as soon as one becomes a monk? Swamiji: Sannyasins are at least struggling to make themselves ready for renunciation, whereas householders are in this matter like boatmen who work at their oars while the boat lies at anchor. Is the desire for enjoyment ever appeased " — It increases ever and ever" (Bhâgavata, IX. xix. 14). Disciple: Why? May not world-weariness come, after enjoying the objects of the senses over and over for a long time? Swamiji: To how many does that come? The mind becomes tarnished by constant contact with the objects of the senses and receives a permanent moulding and impress from them. Renunciation, and renunciation alone, is the real secret, the Mulamantra, of all Realisation. Disciple: But there are such injunctions of the seers in the scriptures as these: " — To restrain the five senses while living with one's wife and children is Tapas." " — For him whose desires are under control, living in the midst of his family is the same as retiring into a forest for Tapasya." Swamiji. Blessed indeed are those who can renounce Kama-Kanchana, living in their homes with their family! But how many can do that? Disciple: But then, what about the Sannyasins? Are they all able to relinquish lust and love for riches fully? Swamiji: As I said just now, Sannyasins are on the path of renunciation, they have taken the field, at least, to fight for the goal; but householders, on the other hand, having no knowledge as yet of the danger that comes through lust and greed, do not even attempt to realise the Self; that they must struggle to get rid of these is an idea that has not yet entered their minds. Disciple: But many of them are struggling for it. Swamiji: Oh, yes, and those who are doing so will surely renounce by degrees; their inordinate attachment for Kama-Kanchana will diminish gradually. But for those who procrastinate, saying, "Oh, not so soon! I shall do it when the time comes", Self-realisation is very far off. "Let me realise the Truth this moment! In this very life!" — these are the words of a hero. Such heroes are ever ready to renounce the very next moment, and to such the scripture (Jâbâla Upanishad, 3.) says, " — The moment you feel disgust for the vanities of the world, leave it all and take to the life of a monk." Disciple: But was not Shri Ramakrishna wont to say, "All these attachments vanish through the grace of God when one prays to Him?" Swamiji: Yes, it is so, no doubt, through His mercy, but one needs to be pure first before one can receive this mercy — pure in thought, word, and deed; then it is that His grace descends on one. Disciple: But of what necessity is grace to him who can control himself in thought, word, and deed? For then he would be able to develop himself in the path of spirituality by means of his own exertions! Swamiji: The Lord is very merciful to him whom He sees struggling heart and soul for Realisation. But remain idle, without any struggle, and you will see that His grace will never come. Disciple: Everyone longs to be good, yet the mind for some inscrutable reasons, turns to evil! Does not everyone wish to be good — to be perfect — to realise God? Swamiji: Know them to be already struggling who desire this. God bestows His mercy when this struggle is maintained. Disciple: In the history of the Incarnations, we find many persons who, we should say, had led very dissipated lives and yet were able to realise God without much trouble and without performing any Sâdhanâ or devotion. How is this accounted for? Swamiji: Yes, but a great restlessness must already have come upon them; long enjoyment of the objects of the senses must already have created in them deep disgust. Want of peace must have been consuming their very hearts. So deeply they had already felt this void in their hearts that life even for a moment had seemed unbearable to them unless they could gain that peace which follows in the train of the Lord's mercy. So God was kind to them. This development took place in them direct from Tamas to Sattva. Disciple: Then, whatever was the path, they may be said to have realised God truly in that way? Swamiji: Yes, why not? But is it not better to enter into a mansion by the main entrance than by its doorway of dishonour? Disciple: No doubt that is true. Yet, the point is established that through mercy alone one can realise God. Swamiji: Oh, yes, that one can, but few indeed are there who do so! Disciple: It appears to me that those who seek to realise God by restraining their senses and renouncing lust and wealth hold to the (free-will) theory of self-exertion and self-help; and that those who take the name of the Lord and depend on Him are made free by the Lord Himself of all worldly attachments, and led by Him to the supreme stage of realisation. Swamiji: True, those are the two different standpoints, the former held by the Jnânis, and the latter by the Bhaktas. But the ideal of renunciation is the keynote of both. Disciple: No doubt about that! But Shri Girish Chandra Ghosh (The great Bengali actor-dramatist, a staunch devotee of Shri Ramakrishna.) once said to me that there could be no condition in God's mercy; there could be no law for it! If there were, then it could no longer be termed mercy. The realm of grace or mercy must transcend all law. 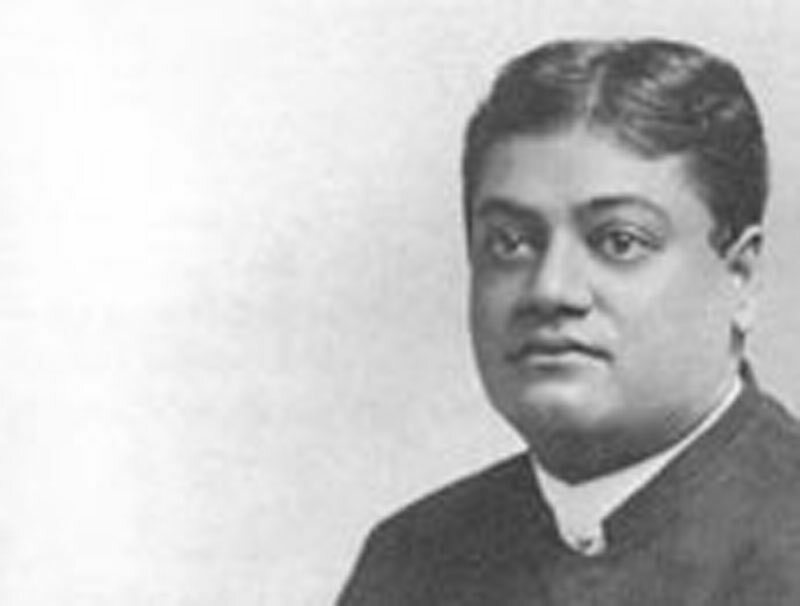 Swamiji: But there must be some higher law at work in the sphere alluded to by G. C. of which we are ignorant. Those are words, indeed, for the last stage of development, which alone is beyond time, space, and causation. But, when we get there, who will be merciful, and to whom, where there is no law of causation? There the worshipper and the worshipped, the meditator and the object of meditation, the knower and the known, all become one — call that Grace or Brahman, if you will. It is all one uniform homogeneous entity! Disciple: Hearing these words from you, Swamiji, I have come to understand the essence of all philosophy and religion (Vedas and Vedanta); it seems as if I had hitherto been living in the midst of high-sounding words without any meaning. Disciple: Pray, Swamiji, do tell me if there is any relation between the discrimination of food taken and the development of spirituality in man. Swamiji: Yes, there is, more or less. Disciple: Is it proper or necessary to take fish and meat? Swamiji: Ay, take them, my boy! And if there be any harm in doing so, I will take care of that. Look at the masses of our country! What a look of sadness on their faces and want of courage and enthusiasm in their hearts, with large stomachs and no strength in their hands and feet — a set of cowards frightened at every trifle! Disciple: Does the taking of fish and meat give strength? Why do Buddhism and Vaishnavism preach " — Non-killing is the highest virtue"? Swamiji: Buddhism and Vaishnavism are not two different things. During the decline of Buddhism in India, Hinduism took from her a few cardinal tenets of conduct and made them her own, and these have now come to be known as Vaishnavism. The Buddhist tenet, "Non-killing is supreme virtue", is very good, but in trying to enforce it upon all by legislation without paying any heed to the capacities of the people at large, Buddhism has brought ruin upon India. I have come across many a "religious heron"! * in India, who fed ants with sugar, and at the same time would not hesitate to bring ruin on his own brother for the sake of "filthy lucre"! Disciple: But in the Vedas as well as in the laws of Manu, there are injunctions to take fish and meat. Swamiji: Ay, and injunctions to abstain from killing as well. For the Vedas enjoin, " — Cause no injury to any being"; Manu also says, " — Cessation of desire brings great results." Killing and non-killing have both been enjoined, according to the individual capacity, or fitness and adaptability on those who will observe the one practice or the other. Disciple: It is the fashion here nowadays to give up fish and meat as soon as one takes to religion, and to many it is more sinful not to do so than to commit such great sins as adultery. How, do you think, such notions came into existence? Swamiji: What's the use of your knowing how they came, when you see clearly, do you not, that such notions are working ruin to our country and our society? Just see — the people of East Bengal eat much fish, meat, and turtle, and they are much healthier than those of this part of Bengal. Even the rich men of East Bengal have not yet taken to Loochis or Châpâtis at night, and they do not suffer from acidity and dyspepsia like us. I have heard that in the villages of East Bengal the people have not the slightest idea of what dyspepsia means! Disciple: Quite so, Swamiji. We never complain of dyspepsia in our part of the country. I first heard of it after coming to these parts. We take fish with rice, mornings and evenings. Swamiji: Yes, take as much of that as you can, without fearing criticism. The country has been flooded with dyspeptic Bâbâjis living on vegetables only. That is no sign of Sattva, but of deep Tamas — the shadow of death. Brightness in the face, undaunted enthusiasm in the heart, and tremendous activity — these result from Sattva; whereas idleness, lethargy, inordinate attachment, and sleep are the signs of Tamas. Disciple: But do not fish and meat increase Rajas in man? Swamiji: That is what I want you to have. Rajas is badly needed just now! More than ninety per cent of those whom you now take to be men with the Sattva, quality are only steeped in the deepest Tamas. Enough, if you find one-sixteenth of them to be really Sâttvika! What we want now is an immense awakening of Râjasika energy, for the whole country is wrapped in the shroud of Tamas. The people of this land must be fed and clothed — must be awakened — must be made more fully active. Otherwise they will become inert, as inert as trees and stones. So, I say, eat large quantities of fish and meat, my boy! Disciple: Does a liking for fish and meat remain when one has fully developed the Sattva quality? Swamiji: No, it does not. All liking for fish and meat disappears when pure Sattva is highly developed, and these are the signs of its manifestation in a soul: sacrifice of everything for others, perfect non-attachment to lust and wealth, want of pride and egotism. The desire for animal food goes when these things are seen in a man. And where such indications are absent, and yet you find men siding with the non-killing party, know it for a certainty that herein, there is either hypocrisy or a show of religion. When you yourself come to that stage of pure Sattva, give up fish and meat, by all means. Disciple: In the Chhândogya Upanishad (VII. xxvi. 2) there is this passage, " — Through pure food the Sattva quality in a man becomes pure." Swamiji: Yes, I know. Shankarâchârya has said that the word Âhâra there means "objects of the senses", whereas Shri Râmânuja has taken the meaning of Ahara to be "food". In my opinion we should take that meaning of the word which reconciles both these points of view. Are we to pass our lives discussing all the time about the purity and impurity of food only, or are we to practice the restraining of our senses? Surely, the restraining of the senses is the main object; and the discrimination of good and bad, pure and impure foods, only helps one, to a certain extent, in gaining that end. There are, according to our scriptures, three things which make food impure: (1) Jâti-dosha or natural defects of a certain class of food, like onions, garlic, etc. ; (2) Nimitta-dosha or defects arising from the presence of external impurities in it, such as dead insects, dust, etc. that attach to sweetmeats bought from shops; (3) Âshraya-dosha or defects that arise by the food coming from evil sources, as when it has been touched and handled by wicked persons. Special care should be taken to avoid the first and second classes of defects. But in this country men pay no regard just to these two, and go on fighting for the third alone, the very one that none but a Yogi could really discriminate! The country from end to end is being bored to extinction by the cry, "Don't touch", "Don't touch", of the non-touchism party. In that exclusive circle of theirs, too, there is no discrimination of good and bad men, for their food may be taken from the hands of anyone who wears a thread round his neck and calls himself a Brâhmin! Shri Ramakrishna was quite unable to take food in this indiscriminate way from the hands of any and all. It happened many a time that he would not accept food touched by a certain person or persons, and on rigorous investigation it would turn out that these had some particular stain to hide. Your religion seems nowadays to be confined to the cooking-pot alone. You put on one side the sublime truths of religion and fight, as they say, for the skin of the fruit and not for the fruit itself! Disciple: Do you mean, then, that we should eat the food handled by anyone and everyone? Swamiji: Why so? Look here. You being Brahmin of a certain class, say, of the Bhattâcharya class, why should you not eat rice cooked by Brahmins of all classes? Why should you, who belong to the Rârhi section, object to taking rice cooked by a Brahmin of the Barendra section, or why should a Barendra object to taking your rice? Again, why should not the other subcastes in the west and south of India, e.g. the Marathi, Telangi, Kanouji, do the same? Do you not see that hundreds of Brahmins and Kâyasthas in Bengal now go secretly to eat dainties in public restaurants, and when they come out of those places pose as leaders of society and frame rules to support don't-touchism. Must our society really be guided by laws dictated by such hypocrites? No, I say. On the contrary we must turn them out. The laws laid down by the great Rishis of old must be brought back and be made to rule supreme once more. Then alone can national well-being be ours. Disciple: Then, do not the laws laid down by the Rishis rule and guide our present society? Swamiji: Vain delusion! Where indeed is that the case nowadays? Nowhere have I found the laws of the Rishis current in India, even when during my travels I searched carefully and thoroughly. The blind and not unoften meaningless customs sanctioned by the people, local prejudices and ideas, and the usages and ceremonials prevalent amongst women, are what really govern society everywhere! How many care to read the Shâstras or to lead society according to their ordinances after careful study? Disciple: What are we to do, then? Swamiji: We must revive the old laws of the Rishis. We must initiate the whole people into the codes of our old Manu and Yâjnavalkya, with a few modifications here and there to adjust them to the changed circumstances of the time. Do you not see that nowhere in India now are the original four castes (Châturvarnya) to be found? We have to redivide the whole Hindu population, grouping it under the four main castes, of Brahmins, Kshatriyas, Vaishyas, and Shudras, as of old. The numberless modern subdivisions of the Brahmins that split them up into so many castes, as it were, have to be abolished and a single Brahmin caste to be made by uniting them all. Each of the three remaining castes also will have to be brought similarly into single groups, as was the case in Vedic times. Without this will the Motherland be really benefited by your simply crying as you do nowadays, "We won't touch you! ; We won't take him back into our caste!"? Never, my boy!